Barclay James Harvest (continued) – 1978 saw the release of their twelth album (including live releases) XII. Another very good album (they hardly ever made a poor one). Les Holroyd turned in the beautiful Berlin, one of his finest compositions. John decided to prefix all his songs with the descriptors Fact, Fantasy, Fiction etc: The songs as usual, pretty good; one ‘political’ song ‘The Closed Shop’ a science fiction classic ‘Nova Lepidoptera’ and my favourite, which I don’t think they ever sung live ‘Streets of San Francisco’. Woolly had two songs ‘In Search of England’ and ‘Harbour’, both are lovely. But tensions within the band were surfacing. This time, Woolly became dissatisfied with, as he saw it, the direction the band was going in. 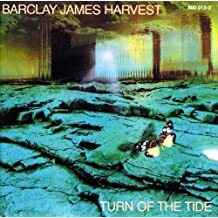 He didn’t like the more commercial ‘poppy’ sounds, he thought they were moving away from the original concept of Barclay James Harvest – as marrying Classical and Rock music. Also, he had collected more and more unreleased songs and decided to leave the band after recording XII. A sad loss, but Woolly was always a bit of a misfit, although I always enjoyed his songs, more classical and quieter than the others. Well, he did almost pursue a solo career (see M) and later when John and Les dissolved the band he re-joined (sporadically) John Lees as he continued under the name BJH thru the eyes of John Lees. So, maybe his difference had more to do with the personality of Les Holroyd than the actual music. We will never know. As the band re-convened to record a new album, which would be their thirteenth Woolly announced he was leaving. The remaining three decided to carry on, at least for the new album Eyes of the Universe, recruiting two players they knew to fill in the sound left by Woolly. But in many ways the band would never be the same again. Moving into the Eighties synthesisers and digital production took over. A harder sound ensued. I still bought their records, but at the time none of us really realised now had happened. The Seventies had ended; that wonderful decade of carrying on from the inventive Sixties, had spawned so many great musicians and bands. Now the business really was a business; no more would record companies take a punt on new groups just starting out – it was all about sales, and sales in those days were huge. BJH were still selling quite well in England but even better in Germany and Europe. But record companies were looking for the new sound of the Eighties. BJH without Woolly and his warm keyboards and Mellotron looked to synthesisers. The new album had some good songs but the most distinctive thing was the harsh brittle sound. This is one of my lesser loved BJH records. No classic songs at all; it almost seemed like they were just going through the motions. Eight songs which add nothing to the bands collection. Oh well.